Lillà apartment is located in a farmhouse on a hill near Gubbio, one of the most beautiful medieval towns in Umbria. In the area are several medieval castles and abbeys. The landscape is characterized by a rough vegetation and it is a suitable place for people who like to have a serene and restful holiday. 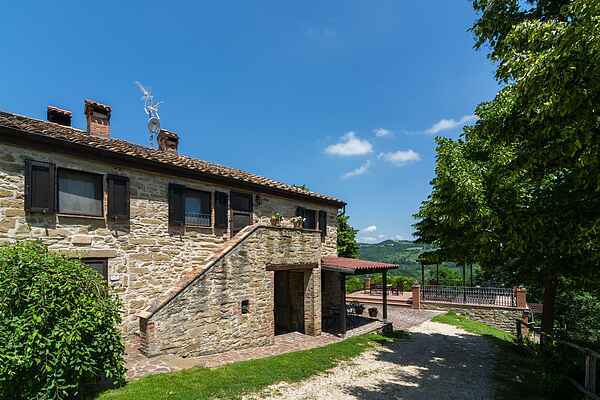 Its rustic farmhouse has stunning views of the Apennines and is just two kilometers from the main road connecting Gubbio in Perugia. The farmhouse consists of three apartments that were completely renovated. The decor is rustic and rural. To reach the house you have to take a dirt road of 1.8 km with a total vertical drop of 80m. There is a large terrace with views of the Apennines an ideal place to enjoy a glass of wine and the view. The agriturismo is 25 km from Assisi and Perugia and about 60 Todi and Spoleto. These are the most beautiful cities of Umbria, rich in history and traditions. All the cities can be achieved in a short period of time. And there are natural parks, caves and waterfalls that are very worthwhile.